These highlights do not include all the information needed to use TASIGNA safely and effectively . See full prescribing information for TASIGNA. See Dosage and Administration (2.1) for full dosing instructions and dose-reduction instructions for toxicity. 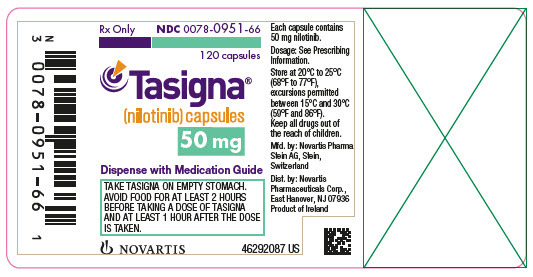 The recommended dose of Tasigna for pediatric patients is 230 mg/m2 orally twice daily, rounded to the nearest 50 mg dose (to a maximum single dose of 400 mg) (see Table 1). If needed, attain the desired dose by combining different strengths of Tasigna capsules. Continue treatment as long as clinical benefit is observed or until unacceptable toxicity occurs. Ph+ CML-CP patients with typical BCR-ABL transcripts who have been taking Tasigna for a minimum of 3 years and have achieved a sustained molecular response (MR4.5, corresponding to = BCR-ABL/ABL â‰¤ 0.0032% IS) may be eligible for treatment discontinuation [see Clinical Studies (14.3, 14.4)]. Information on FDA authorized tests for the detection and quantitation of BCR-ABL transcripts to determine eligibility for treatment discontinuation is available at http://www.fda.gov/CompanionDiagnostics. â— no history of prior attempts of treatment-free remission discontinuation that resulted in relapse. Monitor BCR-ABL transcript levels and complete blood count with differential in patients who have discontinued Tasigna therapy monthly for one year, then every 6 weeks for the second year, and every 12 weeks thereafter [see Warnings and Precautions (5.16)]. Upon the loss of MR4.0 (corresponding to = BCR-ABL/ABL â‰¤ 0.01%IS) during the treatment-free phase, monitor BCR-ABL transcript levels every 2 weeks until BCR-ABL levels remain lower than major molecular response (MMR, corresponding to MR3.0 or = BCR-ABL/ABL â‰¤ 0.1%IS) for 4 consecutive measurements. The patient can then proceed to the original monitoring schedule. 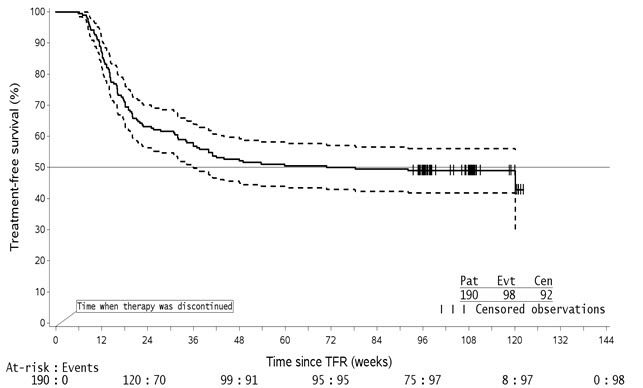 2.3 Reinitiation of treatment in patients who lose molecular response after discontinuation of therapy with Tasigna. â— Newly diagnosed patients who lose MMR must reinitiate treatment within 4 weeks at the dose level prior to discontinuation of therapy [see Warnings and Precautions (5.16)]. Patients who reinitiate Tasigna therapy should have their BCR-ABL transcript levels monitored monthly until major molecular response is re-established and every 12 weeks thereafter. â— Patients resistant or intolerant to prior treatment that included imatinib with confirmed loss of MR4.0 (2 consecutive measures separated by at least 4 weeks showing loss of MR4.0) or loss of MMR must reinitiate treatment within 4 weeks at the dose level prior to discontinuation of therapy [see Warnings and Precautions (5.16)]. Patients who reinitiate Tasigna therapy should have their BCR-ABL transcript levels monitored monthly until previous major molecular response or MR4.0 is re-established and every 12 weeks thereafter. If clinically significant moderate or severe non-hematologic toxicity develops (including medically severe fluid retention), see Table 5 for dose adjustments [see Adverse Reactions (6.1)]. Tasigna may result in hepatotoxicity as measured by elevations in bilirubin, AST, ALT, and alkaline phosphatase. Grade 3-4 elevations of bilirubin, AST, and ALT were reported at a higher frequency in pediatric than in adult patients. Monitor hepatic function tests monthly or as clinically indicated [see Warnings and Precautions (5.12)]. Based on findings from animal studies and its mechanism of action, Tasigna can cause fetal harm when administered to a pregnant woman. In animal reproduction studies, administration of nilotinib to pregnant rats and rabbits during organogenesis caused adverse developmental outcomes including embryo-fetal lethality/fetal effects (small renal papilla, fetal edema, and skeletal variations) in rats and increased resorptions of fetuses and fetal skeletal variations in rabbits at maternal AUCs approximately 2 and 0.5 times, respectively, the AUC in patients receiving the recommended dose. Advise pregnant women of the potential risk to a fetus. Advise females of reproductive potential to use effective contraception during treatment and for at least 14 days after the last dose [see Use in Specific Populations (8.1, 8.3) and Clinical Pharmacology (12.1)]. Monitor BCR-ABL transcript levels in patients eligible for treatment discontinuation using an FDA authorized test validated to measure molecular response levels with a sensitivity of at least MR4.5 (BCR-ABL/ABL â‰¤ 0.0032% IS). In patients who discontinue Tasigna therapy, assess BCR-ABL transcript levels monthly for one year, then every 6 weeks for the second year, and every 12 weeks thereafter during treatment discontinuation [see Clinical Studies (14.3,14.4) and Dosage and Administration (2.2)]. Newly diagnosed patients must reinitiate Tasigna therapy within 4 weeks of a loss of Major Molecular Response (MMR, corresponding to MR3.0 or = BCR-ABL/ABL â‰¤ 0.1%IS). Patients resistant or intolerant to prior treatment which included imatinib must reinitiate Tasigna therapy within 4 weeks of a loss of MMR or confirmed loss of MR4.0 (two consecutive measures separated by at least 4 weeks showing loss of MR4.0, corresponding to = BCR-ABL/ABL â‰¤ 0.01%IS). 2. Adult patients with resistant or intolerant Ph+ CML-CP and CMP-AP 24 monthsâ€™ analysis. In rats, oral administration of nilotinib produced embryo-lethality/fetal effects at doses â‰¥ 30 mg/kg/day. At â‰¥ 30 mg/kg/day skeletal variations of incomplete ossification of the frontals and misshapen sternebra were noted, and there was an increased incidence of small renal papilla and fetal edema. At 100 mg/kg/day, nilotinib was associated with maternal toxicity (decreased gestation weight, gravid uterine weight, net weight gain, and food consumption) and resulted in a single incidence of cleft palate and two incidences of pale skin were noted in the fetuses. A single incidence of dilated ureters was noted in a fetus also displaying small renal papilla at 100 mg/kg/day. Additional variations of forepaw and hindpaw phalanx unossified, fused sternebra, bipartite sternebra ossification, and incomplete ossification of the cervical vertebra were noted at 100 mg/kg/day. After a single 20 mg/kg of [14C] nilotinib dose to lactating rats, the transfer of parent drug and its metabolites into milk was observed. The overall milk-to-plasma exposure ratio of total radioactivity was approximately 2, based on the AUC0-24h or AUC0-âˆž values. No rat metabolites of nilotinib were detected that were unique to milk. Nilotinib drug substance, in the form of monohydrochloride monohydrate, is a white to slightly yellowish to slightly greenish yellow powder with the molecular formula and weight, respectively, of C28H22F3N7OHCl H2O and 584 (corresponding molecular formula and weight of nilotinib base, anhydrous are C28H22F3N7O and 529 respectively). The solubility of nilotinib in aqueous solutions decreases with increasing pH. 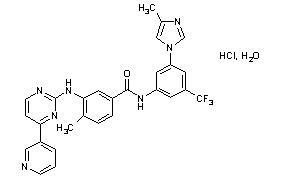 Nilotinib is not optically active. The pKa1 was determined to be 2.1; pKa2 was estimated to be 5.4. Steady-state nilotinib exposure was dose-dependent with less than dose-proportional increases in systemic exposure at dose levels higher than 400 mg given as once or twice daily dosing. In adult patients with resistant or intolerant Ph+ CML given Tasigna 400 mg twice daily, the steady-state mean (%CV) Cmax and AUC0-12h were 2260 ng/ml (35%) and 18000 ngâˆ™h/ml (33%), respectively. In adult patients with newly diagnosed Ph+ CML given Tasigna 300 mg twice daily, the steady-state mean (%CV) Cmax and AUC0-12h were 1540 ng/ml (48%) and 13337 ngâˆ™h/ml (46%), respectively. The ENESTfreedom (Evaluating Nilotinib Efficacy and Safety in clinical Trials-freedom) study (NCT01784068) is an open-label, multicenter, single-arm study, where 215 adult patients with Ph+ CML-CP treated with Tasigna in first-line for â‰¥ 2 years who achieved MR4.5 as measured with the MolecularMD MRDxâ„¢ BCR-ABL Test were enrolled to continue Tasigna treatment for an additional 52 weeks (Tasigna consolidation phase). No more than two assessments falling between MR4 and MR4.5 (0.0032% IS < BCR-ABL/ABL â‰¤ 0.01% IS). The 4 last quarterly assessments (taken every 12 weeks) showed no confirmed loss of MR4.5 (BCR-ABL/ABL â‰¤ 0.0032% IS) during 1 year. 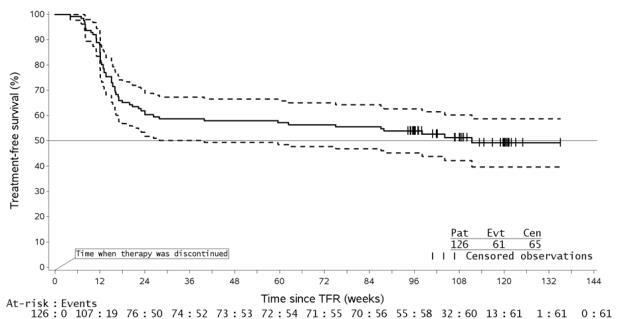 The median age of patients who entered the TFR phase was 56 years, 55.6% were females, and 27.8% of the patients were â‰¥ 65 years of age. The median actual dose intensity during the 52-week Tasigna consolidation phase was 771.8 mg/day with 52.4%, 29.4%, 0.8%, 16.7% and 0.8% of patients receiving a daily Tasigna dose of 800 mg, 600 mg, 450mg, 400mg and 300mg just before entry into the TFR phase, respectively. In patients with resistant or intolerant CML, the major molecular response (MMR; BCR-ABL/ABL â‰¤0.1% IS) rate was 40.9% (18/44, 95% CI: 26.3%, 56.8%) at 12 cycles (28 days per cycle). In patients with newly diagnosed CML, the MMR rate was 60.0% (15/25, 95% CI: 38.7%, 78.9%) at 12 cycles. In patients with resistant or intolerant CML, the cumulative MMR rate was 47.7% (21/44) by cycle 12. In patients with newly diagnosed CML, the cumulative MMR rate was 64.0% (16/25) by cycle 12. Among patients with resistant or intolerant CML, 4.5% of patients achieved BCR-ABL/ABL â‰¤0.0032% IS (MR4.5) by the cut-off date. Among patients with newly diagnosed CML, the percentage of patients who achieved MR4.5 was 28.0%. Tasigna (nilotinib) 50 mg capsules are red opaque cap and light yellow opaque body hard gelatin capsules, size 4 with black radial imprint â€œNVR/ABL.â€ Tasigna (nilotinib) 150 mg capsules are red opaque hard gelatin capsules, size 1 with black axial imprint â€œNVR/BCR.â€ Tasigna (nilotinib) 200 mg capsules are light yellow opaque hard gelatin capsules, size 0 with the red axial imprint â€œNVR/TKI.â€ Tasigna 50 mg capsules are supplied in bottles and Tasigna 150 mg and 200 mg capsules are supplied in blister packs. Advise patients that Tasigna and certain other medicines, including over the counter medications or herbal supplements (such as St. Johnâ€™s Wort), can interact with each other [see Drug Interactions (7)]. It is important that you are followed by your healthcare provider and undergo frequent monitoring to find out if you need to re-start your Tasigna treatment because you are no longer in TFR. Follow your healthcare providerâ€™s instructions about re-starting Tasigna if you are no longer in TFR.